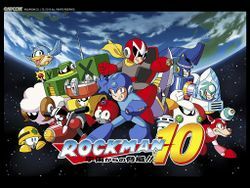 Mega Man 10, known as Rockman 10: Threat From Outer Space!! (ロックマン10 宇宙からの脅威! !, Rokkuman 10: Uchū kara no Kyōi!!?) in Japan, is the tenth main entry of the classic Mega Man series (not including Mega Man & Bass). Like its predecessor, Mega Man 9, it is a downloadable title for the same services—WiiWare, PlayStation Network, and Xbox Live Arcade—and is based on the look and feel of the early NES titles. Mega Man 10 has three playable characters: Mega Man, Proto Man, and Bass (via downloadable content). The Robot Masters in the game are Sheep Man, Commando Man, Blade Man, Strike Man, Solar Man, Chill Man, Nitro Man, and Pump Man. An easy mode is also included in the game. Similar to a feature offered in Mega Man Powered Up, this option alters levels, such as placing platforms over spike pits, and decreases AI and damage done to Mega Man. Also similarly to Powered Up, there is a Challenges mode where players can practice their skills in 88 mini-stages, which typically require Mega Man to reach a goal or defeat an enemy. Returning features from the previous game include an in-between-level item shop and downloadable content. This page was last edited on 5 December 2017, at 00:09.